This headband fits 5 years - adult - if needed it can be secured a little more with bobby pins. 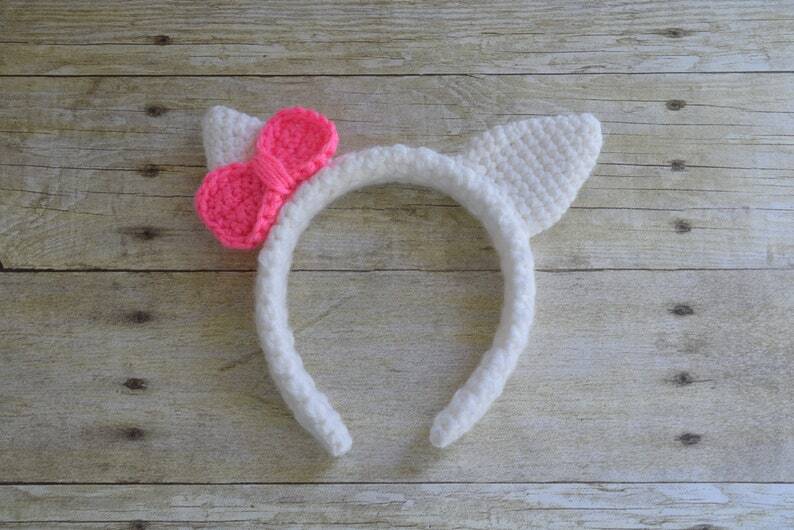 It is crocheted over a white plastic headband that is 1" wide and 14" long. It then has the ears sewn on. I can make these in other colors too, just message me so we can discuss the possibilities. All parts are crocheted; there are no pieces made of felt, buttons ( that could cause a choking hazard) or other material. Made lovingly in a smoke-free home with Durable Acrylic Yarn. These headbands are crocheted by me and are made to order so please allow up to 2 weeks for them to be made and shipped (although this is worst case scenario). Join my Facebook VIP Club GROUP where I will post shop announcements, exclusive sales, giveaways, coupon codes etc.